Troxel Helmets Home Testimonials I wasn't wearing a helmet and I have a dent in the back of my skull to prove it! I wasn't wearing a helmet and I have a dent in the back of my skull to prove it! 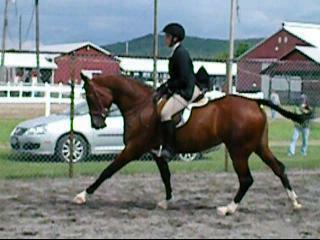 Aug 3rd, 2011: I was riding my mare, and after a fabulous session, was walking her back to the barn (still mounted). She tripped and that's the last thing I remember. No spook or misbehavior, on level ground and soft grass, she tripped and I remember thinking to myself "uh oh we are falling". 12 hours later is when tiny bits and pieces of memory started to "stick" again. I never regained any memory of the accident and over the next four days, I probably only recall a few hours of it. I was apparently found (conscious), bleeding profusely from the left ear and lying on the ground. I suffered a severe head injury that included multiple skull fractures and subdural hematomas. The connective tissue had even torn on the right side between my brain and my skull, resulting in further trauma to that side of my brain. I was medivaced to a hospital's trauma unit where I spent 4 days. When I was sent home I couldn't stand up or walk on my own still. I couldn't see even with my contacts in or my glasses on, my vision was so blurry from the injury. I was deaf in my left ear from all the blood that exited through the ear canal. I could BARELY eat or drink anything as all I did was vomit. (Lost 25 lbs in a week!). There was also a myriad of other issues I was faced with. Guess what? I wasn't wearing a helmet and I still have a dent in the back of my skull to prove it. It's not that I ever made a decision to NOT wear a helmet, goodness I have TWO of them (now three!). I just got lazy and failed to see how important it actually is. I am very, very lucky. I was told that I would be out of work for at least 6 months and would have lasting effects from this injury. Part to an active, healthy lifestyle and sheer determination, I returned to work in a mere 3 weeks. Now, I wasn't back to "normal", and still am not in some ways (none that are detrimental to daily life), but I know for sure how blessed and fortunate I am to be able to return to my life as I knew it before my accident. The point I want to make by sharing my story is that this can happen to anyone, on any horse, at any time. I have known my mare since birth, broke her myself and am the only one that has ever ridden her. I know her like that back of my hand and she is mannerly, obedient and safe. I have been riding horses since I was 10 years old (will be 27 soon). I graduated from Centenary College with a BS in Equine Science and my concentration was riding instruction and training. I have worked for farms with high end show horses, as well as managed and ran the training program for an off track thoroughbred rescue. So I'm far from an inexperienced "backyard" horse owner. Freak occurrences and accidents can happen to even the most experienced horse person. PLEASE wear your helmet! I bought myself a new helmet for Christmas so that when I was ready to ride again, there would be no excuses! I want to be able to ride for the rest of my life. It's our job as equestrians to protect ourselves and make good decisions so that we can continue to enjoy our sport, hobby and passion for as long as possible. Anything can happen even if you do wear your helmet, but it would be sad to see your life changed for the worse because of something a helmet could have prevented. I was given a second chance. Please learn from my mistake and wear your helmet every time you ride.